We all make mistakes, and when it comes to losing weight these mistakes can be costly! They can result in preventing weight loss, or adding back on lost weight. Wondering how to get control over your weight loss for good, keep reading to find out which weight loss mistakes you need to avoid for good! You might think this is a waste of time, but unless you’re on a Kcal Extra Meal Plan that provides you with the exact portion of food you need, there is no way you can actually make sure you’re getting the right amount. Having control over your portions is important to ensure you’re not over or under eating. You can use references to the size of your palm is equal to 4 oz of chicken breast (or one serving of meat), the reality is that the only way you can know exactly how much something weighs is by using proper measuring devices including a digital food scale. Without proper weighing, you are just guessing and if you’re hungry it will be easy to go overboard on the portion sizes. Invest in a digital food scale and a set of measuring cups. If you have been following a weight loss plan for some time and feel that you should be rewarded for your success, don’t do it with food! 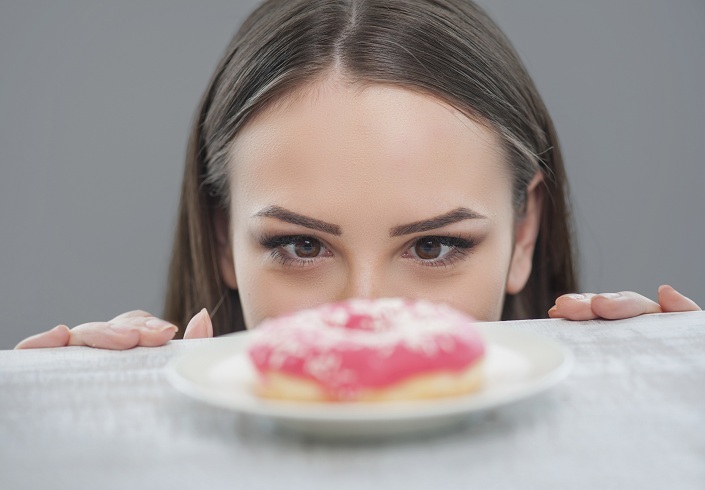 Sometimes dieting can be boring, eating the same foods day in and day out, it can be hard to not want to splurge and it’s easy to feel like you deserve a “reward” after completing a weight loss goal. But food splurges can result in diet melt-downs. Instead of having just one cookie, that one cookie can lead to eating many cookies. A better way to reward yourself is to have set cheat meals once per week to help satisfy you and keep cravings under control, without going overboard. Resist the urge to buy boxes of cookies or bags of chips. Keep the junk away from your kitchen, instead go out and enjoy one cheat meal. You can also celebrate success in other ways, like a spa day or buy a nice new outfit you can show off your new curves with. Setting yourself up for success on any weight loss plan, means you need to remove temptation out of reach. That means clearing the cupboards, fridge, and freezer from all those delightful and tempting snack items that can derail any diet plan fast. Start your diet off on the right foot, and fill your fridge and your cabinets with only the food that is on your diet. You will be less likely to indulge in something if it’s not there—chances are you won’t make the effort to go outside of the home to get it. Stalk up on good items to snack on such as nuts, fresh fruit, cut up veggie sticks, natural yogurt or cottage cheese. All these items are easy to eat and better for you! It can easy to be lazy when you’re super busy and have multiple commitments. Eating healthy and sticking to your weight loss plan can seem much less important. Losing weight takes work prepping healthy food is a big part of any successful weight loss plan when it comes to transforming your body. Plan your meals weekly and establish days for grocery shopping and meal prep. Cook and portion out your meals, then freeze them for a complete meal at any time. There should be no excuses for missing meals or eating something you shouldn’t. The more consistent you are, the better your results will be and the best way to attain consistency is to use a schedule. By being really consistent, it becomes a habit, and by becoming a habit, it becomes a seamless part of your lifestyle. It also makes it easier to identify where things are going wrong and how to fix them. If you always have a backup plan, you are less likely to stray from your diet. If you know you have a social event you will be going to, like a birthday party or a wedding, ask for a special meal request, eat before you go and/or bring your food with you. If you are traveling for a vacation or work, call the hotel ahead of time to see if they have healthy options or book a suite with a kitchen so you can prepare healthy meals. Be sure to bring healthy diet appropriate snacks like nuts, protein powder, tuna, veggie sticks and/or fruit with you. This will ensure that you don’t get stuck in an airport, in traffic or at an event without a healthy food choice. Sometimes weighing yourself can lead to disappointment, but it is important to use some form of measurement to ensure you’re on the right track to weight loss success. You can use a measuring tape, take pictures, judge how your clothes are fitting, and use a weight scale. You can also use a body composition machine to see if your body fat levels are going down and your lean muscle mass is going up. It’s easy for weight to creep up and get out of control before you even realize its happening. That said, don’t become weight obsessed; a once a week check-in can help ensure you’re making weight loss progress. You need to feel excited about your decision to lose weight. Without motivation or a goal, it will be very hard to stick to healthy eating or exercise program to continue to lose weight. Remember it takes time to lose weight, nothing will happen overnight. You need to motivate yourself enough to stay on your plan for the long-run! Healthy and sustainable weight loss is slow, occurring at a rate of just 2 lbs per week. Find a goal that is important enough to you to make you stay the course. Do you want to get back to a post-pregnant body? Fit back into your skinny jeans; look great for your wedding or an upcoming vacation? Choose a goal and make it SMART - specific, measurable, attainable, and realistic and time sensitive. Start small by making weekly goals that will lead to your long-term goal. Each goal you set should keep you motivated enough to keep you going! Without a set diet plan it can be very easy to go off track. If you don’t know how many calories you’re putting into your body and are uncertain how much protein, carbs, and fats you need to be consuming and are eating certain foods at the wrong times, you are only setting yourself up to fail. Be sure to come up with a solid diet plan that is low enough in calories to cause a deficit of about 500 calories to ensure weight loss, but not too low that you set yourself up for failure. Aim to eat five to six small meals per day, and make sure each one includes protein. Eating small meals more frequently will help stabilize blood sugar levels, which means you will be less likely to cheat or go off your diet. If you are unsure how to construct a diet plan, visit a Kcal Extra Nutritionist and let us build you a personalized Kcal Extra Meal Plan that fits your lifestyle and your goals.